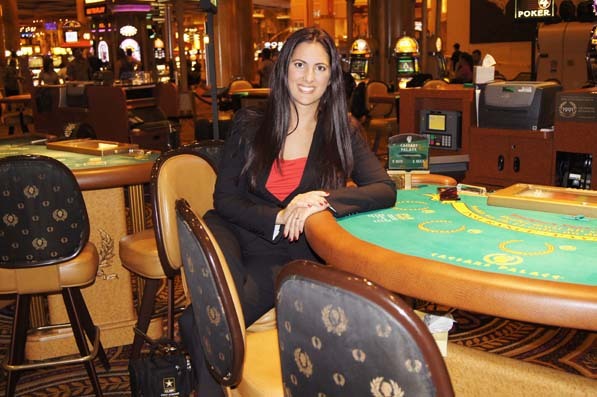 Vegas VP Jacqueline Beato enjoys her incredibly “cool” job working as VP of finance for Caesars Entertainment. Jacqueline Beato has had a truly impressive career. Case in point: just in her early thirties and she leads a team of eight in her role as vice president of finance for Caesars Entertainment, the worldwide gaming, hotel, and resort company previously known as Harrah’s Entertainment. Beato came to Las Vegas’s gaming industry via Wall Street, where—because of her acceptance into the prestigious Sponsors for Educational Opportunity Investment Banking program—she interned as an analyst on Wall Street before she was 21. Getting into the program as an engineering major was not common, but her honest approach worked like a charm. The US gaming industry is still recovering from the impact of the financial crisis. However, Las Vegas visitation has now surpassed 2007 peak levels, and we are beginning to see momentum in that market. The regional US markets are also seeing growth through gaming expansion in states like Ohio, Maryland, and Massachusetts. Once working as a trader full-time, it didn’t take long for the vice president to realize Wall Street wasn’t for her. While the work was challenging, the culture didn’t agree with her, especially after finding out her bonus was significantly less than her male counterparts. She bounced back from the experience quickly, graduating from Harvard Business School before joining Harrah’s and moving up the ranks, eventually landing her role as VP of finance for Caesars Entertainment; Harrah’s changed its name to Caesars in 2010. Beato says her mom was full of encouraging, sometimes cliché mottos. Every single day when her mom dropped her off in front of her school, Beato’s mom said, “Today is the first day of the rest of your life, so make it the best that you can!” At the time, Beato was painfully shy, but with her mom’s encouragement and support, the affirmations began to sink in, transforming her into the kind of young woman who dared to be different. “So much of what she was trying to teach me was the understanding that life wasn’t fair, you couldn’t internalize it. You just had to get on with it. She helped me build resilience and it wasn’t something I realized until later when I encountered setbacks. I think it’s also why it is so important to me to help others, to make a difference. I want to pass on these lessons, and help others grow,” Beato says. After her experience on Wall Street, which left her feeling disappointed and unfulfilled, Beato made a promise to herself that upon graduating from Harvard, she would find a job where she felt like she was making an impact. She didn’t want “business as usual;” she wanted meaningful interactions and to her, that meant being in a leadership position. While working for Harrah’s in Joliet, Beato was given the opportunity to have direct reports and it was everything she hoped for. She now truly understood that with the responsibility to meet objectives and manage a team, comes a responsibility to positively impact the lives of those you manage, to help them progress within the company and grow professionally. As has often been the case over the course of her career, Beato’s young age puts her in a unique position, requiring the VP to take a more delicate, nuanced approach to direct reports, who are almost always older than her. As a matter of fact, during her time with Harrah’s in Joliet when she was in her early twenties, Beato had a direct report almost 40 years older. Beato sometimes forgets that though she does work in finance, working for Caesars in the heart of Sin City is definitely outside of the norm. During a recent meeting with the CFO to discuss the specifics of a new artist Caesars will be working with, Beato had a surreal moment where she was hit with the realization that her job is incredibly “cool.” It’s not all glamour and pop stars, however. Caesars has a massive amount of debt that Beato is working tirelessly to reduce and the fact that the company is owned by two private-equity firms means that there’s still a great deal of work to be done. Slowly, but surely, Beato and her team are making progress, especially after completing an initial public offering in February 2012.